This is the latest offering from the author Dan Brown. Like all of his other Langdon stories this book is based on a treasure hunt that follows clue after clue to discover the sinister background that the clues unveil. 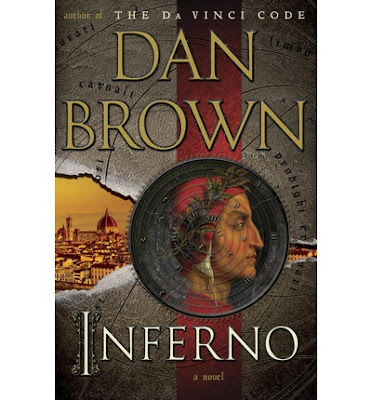 In this title, Brown builds his suspense-filled adventure around the Italian Poet of the Middle-ages, Dante, and his well-known literary masterpiece "The Divine Comedy" which follows Dante's journey through Hell. Mr. Brown set the pedestal rather high after his extremely successful "Da Vinci Code" which still remains my favourite Brown title. Unfortunately, I too judge each of his latest titles on offer with the same high set-standard and do find that his other works, although each satisfying reads in their own right, never quite hit the same exceptional level as his first great title. Followers of Brown's work may agree with me, that seeing the name Robert Langdon included in the synopsis, created an urgency to see where the next adventure would take us. The book is set in Italy where Robert Langdon finds himself in a hospital with no recollection of the events that lead him there. After being shot at and witnessing a shooting, he is on the run with the abled genius Sienna Brooks, who saves his life and tries to help him piece together the events that brought him to Italy in the first place. Brown manages once again to include lots of twists and turns, intrigues and unkowns in this title as well as touching on the chilling subject of biological and chemical warfare. I have read all of Dan Brown's literary work and I can appreciate his latest piece. I must admit that I found this book to be an extremely long read, not really my experience with Brown's work until now. I found myself chewing through parts of the story and was a little disappointed that it was somewhat predictable in others. Overall, this is a great adventure and is a good read for those of you who appreciate a book that takes you places, with a gripping plot. Will you be joining me for the first "Turning The Pages" Online Book-Club Event?